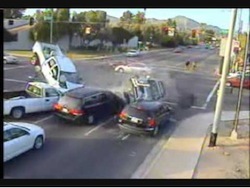 Red Light Intersection Accident Injury Attorneys With Over 40 Years of Experience That You Can Trust! According to a 2008 report from the National Highway Traffic Safety Administration (NHTSA)., red light accident collisions caused 762 deaths; and the NHTSA also has estimated that approximately 165,000 people are injured in red light car and other accidents each year. If you or a loved one have sustained any injury, or if you know anyone who was killed in a red light car accident resulting in a wrongful death accident claim, in Los Angeles, the San Fernando Valley, San Bernardino or anywhere in the state of California, we encourage you to contact our personal injury lawyers and law offices now so you may receive an absolutely FREE COURTESY CONSULTATION from one of our highly qualified red light collision car accident personal injury attorneys. A car lawfully in the intersection turns left after its traffic signal turns red as another second driver, not aware that the first car is making a left turn, accelerates (or “jumps the light”) on the green light and crashes into the left turning car. Bad weather conditions that include a blinding setting sun, rain, snow, icy roads and fog. Most of the time, the fault (i.e., the legal liability) for a red light car accident falls on the driver who entered or crossed into the intersection on the red light. A typical example occurs when the at fault car enters on a red traffic light when the opposing car, already lawfully in the intersection, turns left blocking the path of the car that entered the intersection on a red light, resulting in a violent two-car collision. 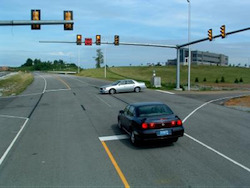 In addition, there are times when a driver enters the intersection on a green but is still at fault, including when the first driver, already lawfully in the intersection and waiting for traffic to clear before turning left, then completes the left-turn right after the light turns red, when the second vehicle, entering on a green light in a perpendicular direction “jumps the green light” and enters the intersection before the intersection clears and collides with the lawfully left turning vehicle. "A driver facing a steady circular red signal alone shall stop at a marked limit line, but if none, before entering the crosswalk on the near side of the intersection or, if none, then before entering the intersection, and shall remain stopped until an indication to proceed is shown, except as provided in subdivision (b)." "Except when a sign is in place prohibiting a turn, a driver, after stopping as required by subdivision (a), facing a steady circular red signal, may turn right, or turn left from a one-way street onto a one-way street. A driver making that turn shall yield the right-of-way to pedestrians lawfully within an adjacent crosswalk and to any vehicle that has approached or is approaching so closely as to constitute an immediate hazard to the driver, and shall continue to yield the right-of-way to that vehicle until the driver can proceed with reasonable safety." "A driver facing a steady red arrow signal shall not enter the intersection to make the movement indicated by the arrow and, unless entering the intersection to make a movement permitted by another signal, shall stop at a clearly marked limit line, but if none, before entering the crosswalk on the near side of the intersection, or if none, then before entering the intersection, and shall remain stopped until an indication permitting movement is shown." "Unless otherwise directed by a pedestrian control signal as provided in Section 21456, a pedestrian facing a steady circular red or red arrow signal shall not enter the roadway." In a typical red light intersection car accident, the first car or vehicle lawfully entered the intersection on a green or yellow light and is slammed into by a second car or other vehicle which entered against a red traffic signal. Such intersection accidents usually result in violent collisions, with major property damage, often totaling one or both cars or other vehicles, and causing severe personal injuries to the drivers and passengers in their cars, trucks or motorcycles. Common injuries that are caused by the red light collisions are neck and whiplash injuries, due to the strong impact to the side of the vehicle from the second car, as well as back, shoulder, arm, hip and leg injuries, including fractures. In addition, the driver of the car that passes the red light may suffer multiple injuries and fractures ranging from broken shoulders to broken legs and sometimes even a damaged spinal cord that could lead to permanent injuries beyond repair. For more information about our personal injury attorneys and law firm, including our credentials and experience, please visit our home page, Attorney Profiles and Client Testimonials.